Katibawasan Falls Camiguin is a treasured landmark just near the large island of Mindanao in the Philippines. Camiguin Islands is known for its many volcanoes, and finding a refreshing spot like Katibawasan is certainly a great nature treat! Camiguin is truly blessed with this wonderful gift of nature which rushes down into a green body of water where visitors and tourists can have a refreshingly good swim. The Falls is about 250 feet high and rushes down into a rock pool bordered by wild ferns, trees, ground orchids or a terrestrial herb called Spathoglottis Plicataground, including small and large boulders or natural stones, making it a welcome place to cool off especially during hot and humid days. Dropping vines provide a backdrop of the falls. 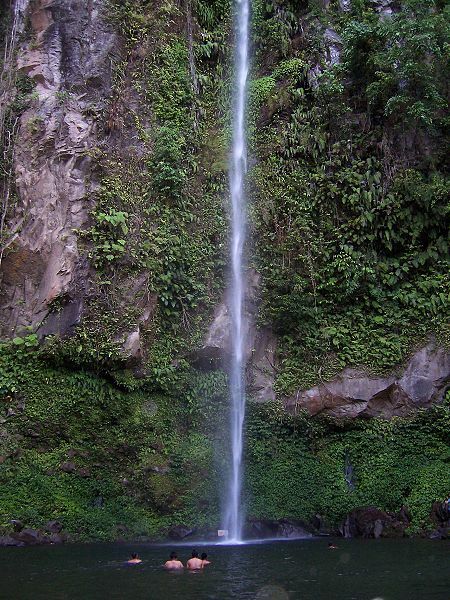 The magnificent falls of Camiguin is located at the foot of a Mount Timpoong which is located in barangay Upper Pandan which is in turn about five kilometers southeast of the town of Mambajao. The area has been filled with abundant souvenir shops where you can buy native products and souvenirs. There is also an ideal spot where the family can bond, a spot for dating or for lovers and a spot where a reunion of friends can be celebrated. The entrance fee to the falls, which is maintained by the provincial government, is only 30 pesos per head. The entrance gate to the Falls has an added attraction. There is a monkey who loves to jump on people proceeding to the Katibawasan Falls as a sign of jealousy since the monkey is protective like that of a site caretaker. Renting a vehicle going to the falls is much more advisable so as not to have problems in finding this wonder of nature. Katibawasan Falls Camiguin is very accessible and safe. You can rent either a multicab, a car, a jeep or a van from the Benoni Port. A walk down the concrete stairs will lead you to the clear bluish-green man-made pool that is made of rocks. The stairs has about 50 to 70 steps. So make sure you don’t forget to explore Camiguin’s waterfalls and include it in your travel destinations.